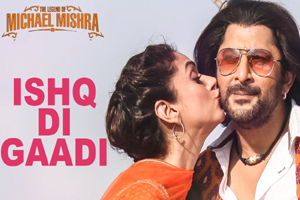 Nice romantic song in the voice of Kartik Dhiman featuring Arshad Warsi and Aditi Rao Hydari. The video of this song is available on YouTube at the official channel T-Series. This video is of 2 minutes 28 seconds duration. Lyrics of "Ishq Di Gaadi"
Lyrics in Hindi (Unicode) of "इश्क दी गाडी"